This little girl came to us a few days after Christmas – and I’ve been back and forth more times than I’d like to admit – on whether or not to keep her. So far since her arrival, I’ve been doing nothing else but caring for her, the same when my children were born. The exhaustion and panic attacks are familiar – but I know they will pass in time. So for now, I’m hanging in there. What makes it particularly hard though, is that the studio doors need to be shut for a while. It’s no place for a puppy. I get anxious when I’m closed off from my work – work that is also therapeutic and keeps my energy grounded. Usually after the holiday rush, I take very little time off before launching in again. 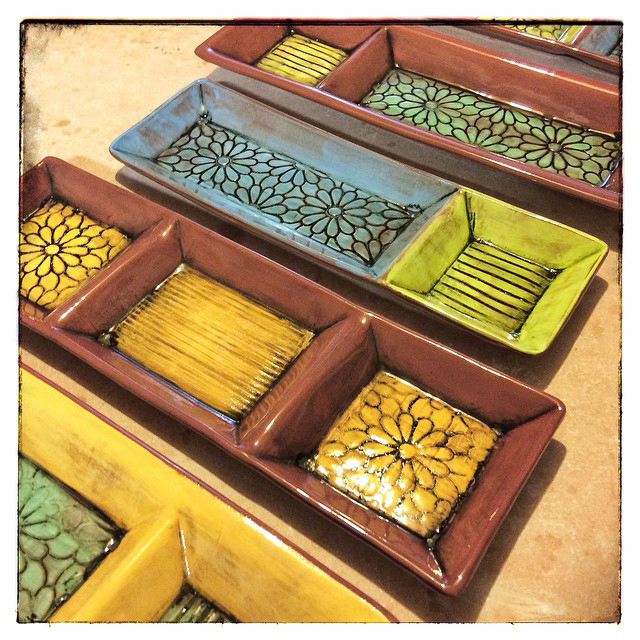 As soon as the New Year comes, I am bursting with fresh ideas, anxious to experiment with different techniques, revisit old glazes and try out new recipes once the shows are over and my regular production schedule is slowed down. But for now, I need to be content with this sweet face that is looking to me for shaping her day, and teaching her the skills she needs to get along well with our family, and I need to learn to sit still. I trust she will eventually learn to be good company in the studio – like my Marley before her – who I still miss deeply. 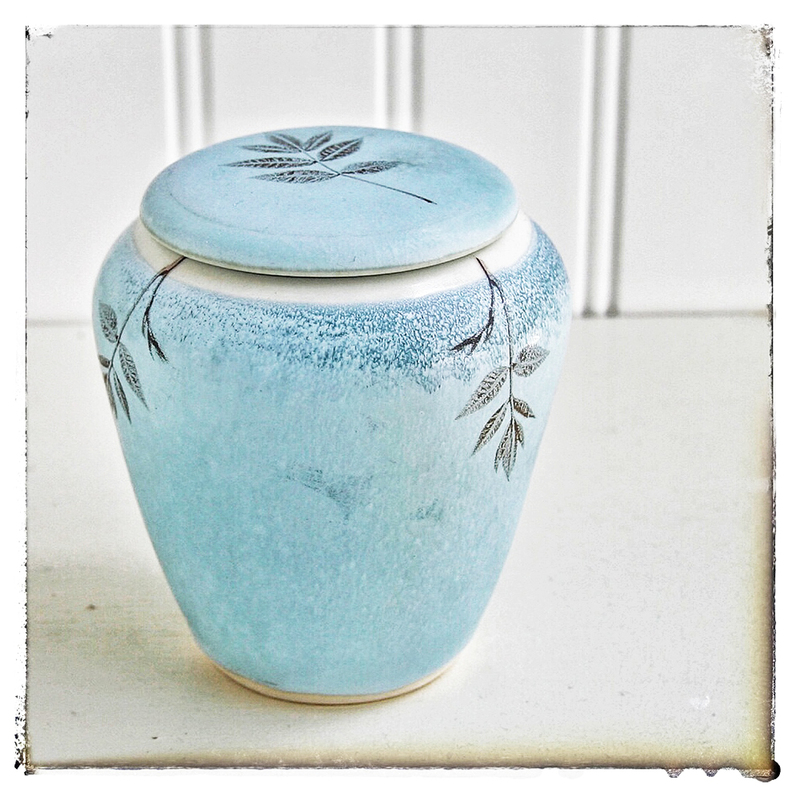 A little memorial urn, made as part of a series for a family who lost a loved one recently. 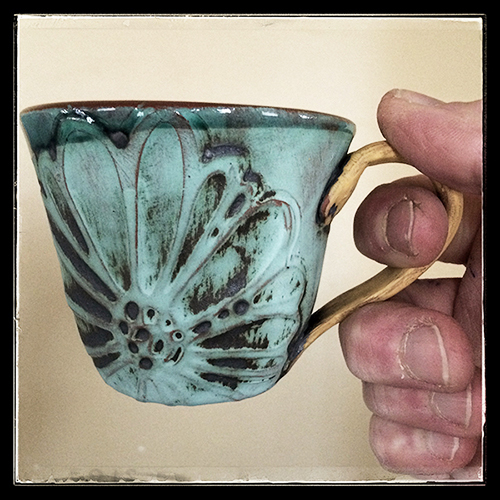 This is a little earthenware test cup that has become my favorite for coffee. I just unloaded a kiln of mostly earthenware divided dishes. This is all new work for me and after doing black and white for almost 2 years straight, these bright colors are a welcomed sight to see. 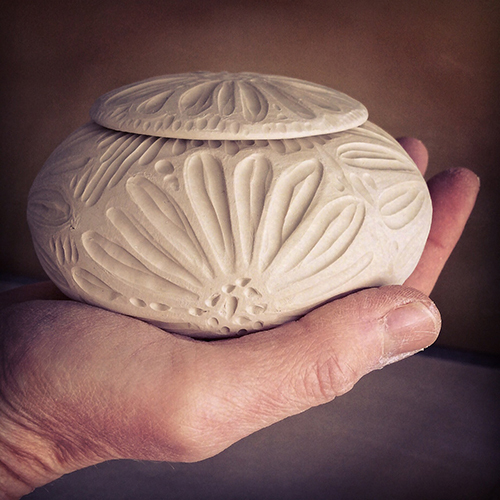 I was asked to make a series of urns in memory of my sister-in-law’s friend who was a gardener. Here is one of them, freshly carved and ready to go on a shelf to dry. Eventually, they will be glazed in a clear glaze with a light green on the inside. A subtle approach, but very much like the woman who’s ashes they will hold – small, delicately sweet and softly spoken.